Some dogs are instantly noticed at the SPA, as they are of a certain breed, or a certain size. Others just seem to go unnoticed as there is nothing in particular to distinguish them. Inevitable they have a harder time being adopted. I would say that the two main groups here are ex-hunt dogs (of whom we have far too many) and the is dogs who are black or mostly black. 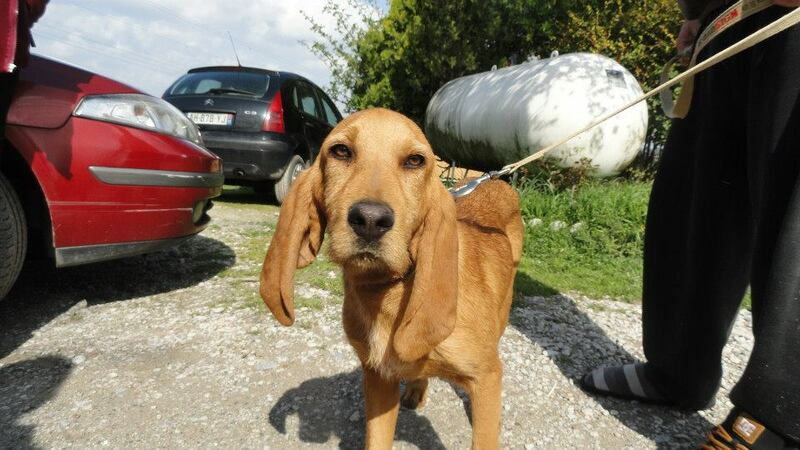 Lizzie arrived at the SPA a couple of months ago, having been found in a nearby village. She was noted on the file as being black with white speckles, and that is about all we could say about her. We have several other dogs who look like her, Blaise being one. And then there are the all-black dogs. Quite a lot of competition! It wasn’t until someone noticed that there were hardly any photos of Lizzie on Facebook that two volunteers took her and her kennel mate out for a walk. The resulting photos, one of which is below, is what turned the tide. Out of the kennel Lizzie proved to be a beautifully attentive dog, keen to show what a great family pet she would be. The photos reflect her willingness to please, and they attracted the attention of a couple who were looking for a new friend, having recently lost one of their own dogs. Lucky girl Lizzie. 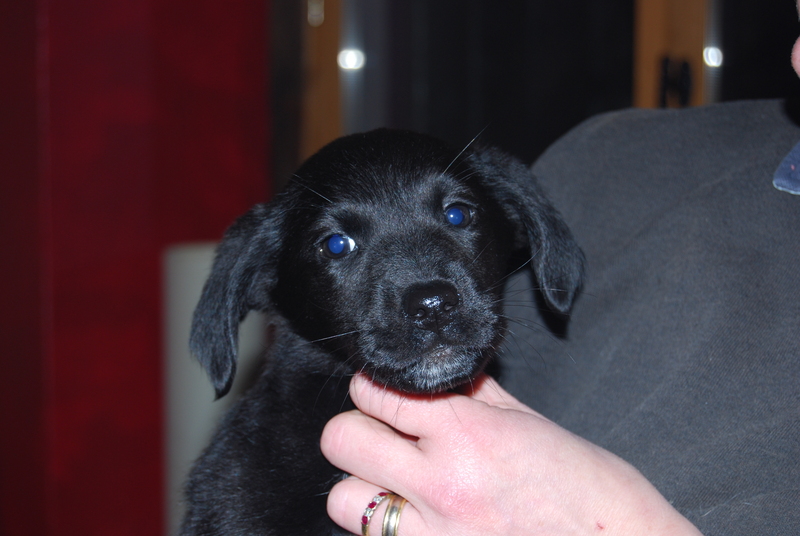 She left today, after having been sterilised, and a wonderful life awaits. If only all our black dogs could be as fortunate! Well, today got a bit weird, to say the least! I arrived at the refuge at 14H00 as normal and spent some time chatting to the employees and discussing which dogs could be mixed with which others to make some room (we are bursting at the seams). A couple of volunteers were out walking dogs in the sunshine, and then all of a sudden a rental car pulled up. “Cats’ balls!” I thought! Several weeks ago the SPA , which currently homes 80 cats, was asked to take part in a DNA collection project for University California Davis. Having been involved in scientific research myself in a previous life, I was happy to agree, and today a geneticist arrived to take swabs from inside the mouths of our cats. She clearly knew what she was doing and between her and Mika there were just a couple of scratches. Amazing, as some of the cats were not exactly thrilled! She and I then went off to the SPA vet, who had kindly been collecting cats testicles for the past couple of weeks. We discussed the project for a bit, and said goodbye. Sadly (or maybe fortunately) my camera was left at the refuge, so I have no pictures of the day’s activities. The images will be in my head for some time to come, however. No Maltesers for me tonight, thanks! There are three boys and a girl, all are black, some have longer hair than others and they have been named Papyrus, Lotus, Nenphar and Magnolia. See, that is what happens when I am not there to choose names! Animal lovers understand that the hardest thing of all is knowing when it is time to say goodbye. Today we said farewell to King, who during his 7 months at the refuge has become something of a mascot. After an unsuccessful attempt to have King fostered (which for legal reasons I won’t explain; we are in the middle of a judicial process for mistreatment), King came back to the refuge. He was very thin and was riddled with cancer. We decided that as long as he wasn’t suffering, he had the right to live. And boy did he live! Some people found it odd that we had a big elderly dog loose in the refuge, albeit one that only walked slowly. 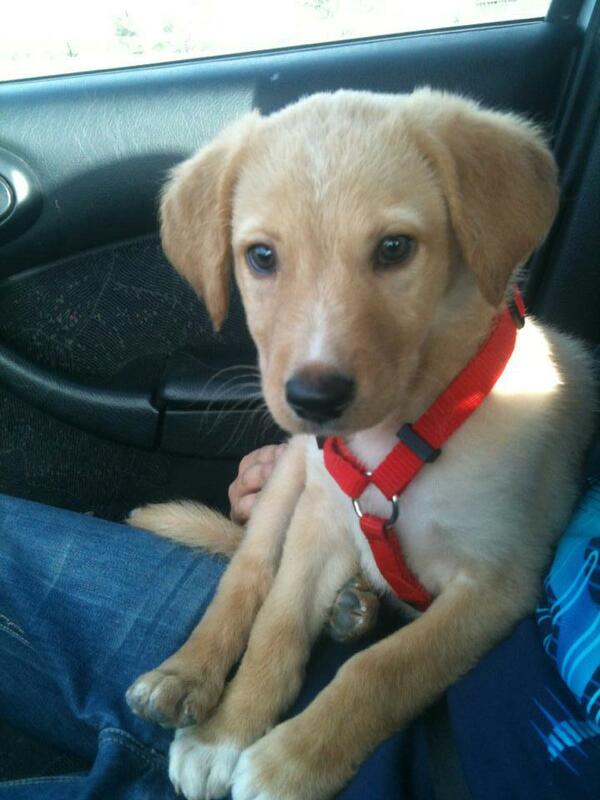 And other people wondered why he went to the vet every Tuesday, with his beloved Mika, one of the refuge employees. But we don’t care what people think. King was happy, he loved his days in the park playing with his girlfriends Zina and Eugenie. And everyone loved King. But over the past couple of weeks it became clear that King was going downhill rapidly. 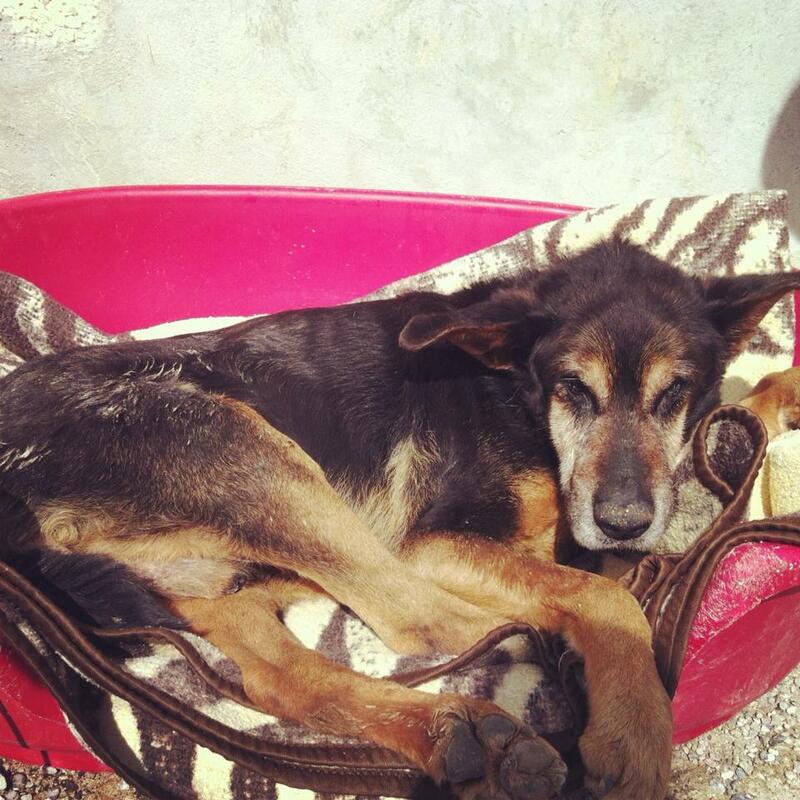 He spent yesterday in his basket in the sunshine, being fed treats and being given cuddles by all the volunteers. We wanted everyone to have a chance to say a proper goodbye to this lovely dignified old man, and it just happened to be open day. And it just happened to be sunny. And there just happened to be cakes! Someone was smiling down on us yesterday, for sure. This morning Mika and I took King on his final trip to the vet, where he died peacefully in our arms. He is now over the Rainbow Bridge. Goodbye King, we will never forget you. King yesterday and last summer with Estelle. I don’t want to make this post like an Oscar acceptance speech, but I really do have a lot of people to say thank you to for all their hard work today. The sun shone, the refuge was immaculate, thanks to two volunteers reinforcing the morning cleaning team, and I think almost every dog on the refuge was walked thanks to a huge turnout of volunteers. 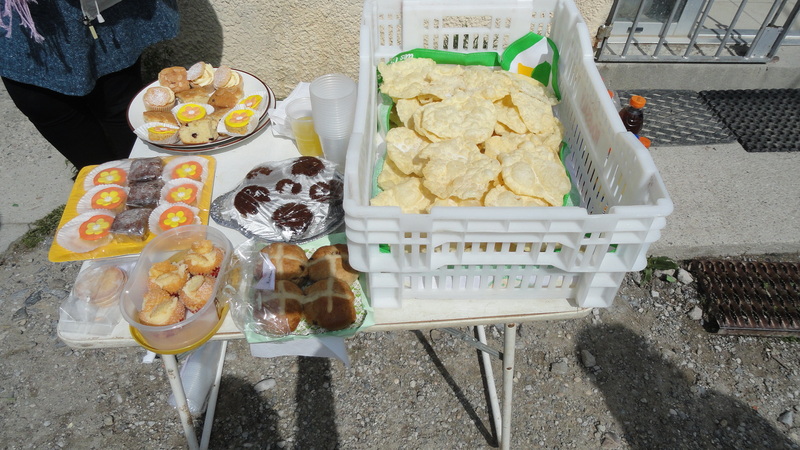 The cake stall raised 40 euros, and we received a further 140 euros in donations. Thanks to everyone who came along to support us and who gave so generously of their time and hard-earned cash. It will be well-spent, I promise. Thanks also to the people who came to visit and show off the dogs they had adopted from us. Lovely to see so many old friends, both canine and human. What a day! So on the adoption front, little Maxime, the fox terrier left, and there were two reservations. That may not sound like much, but it is great news for the dogs! And several people have gone home to “reflect” rather than jump in, which is always wise if you are unsure. 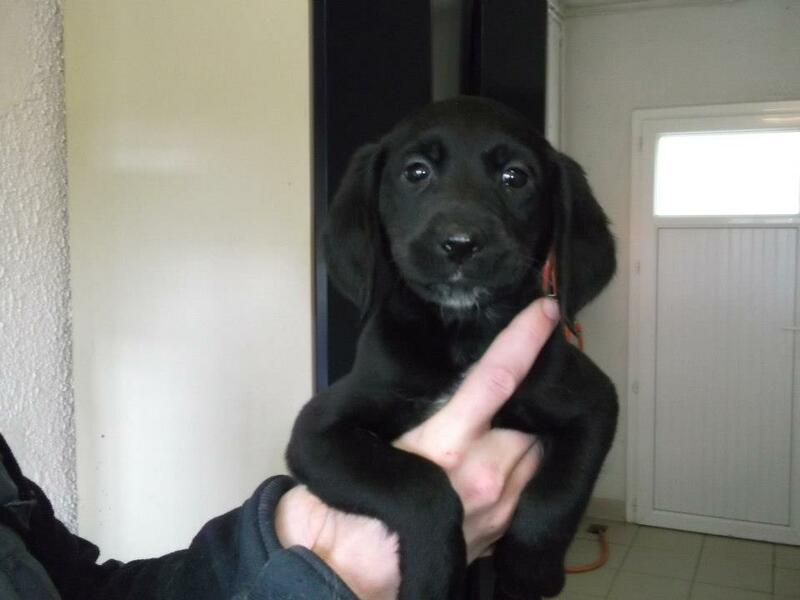 And perhaps the best news of the day is that little Doudou who was brought in yesterday has gone home to be fostered by gentle-hearted Di. She came to sell cakes, she left with a new family member. Such is the life of a SPA volunteer! Thank you everyone. I am exhausted but happy. Only just realised I missed out on the hot cross buns! You may remember Hanover from an earlier post. A couple brought us this ex-hunt dog whom they had found in their village and the woman cried when she left him, saying that she knew we would put him to sleep in 10 days and that he was a good dog who deserved a long and happy life. I promised her that our refuge does not believe in euthanasia and that we would find lovely Hanover a new home. Two days later she phoned up to reserve him and today Hanover left for his new life. He was missing two small details, but I hope he won’t miss them too much! 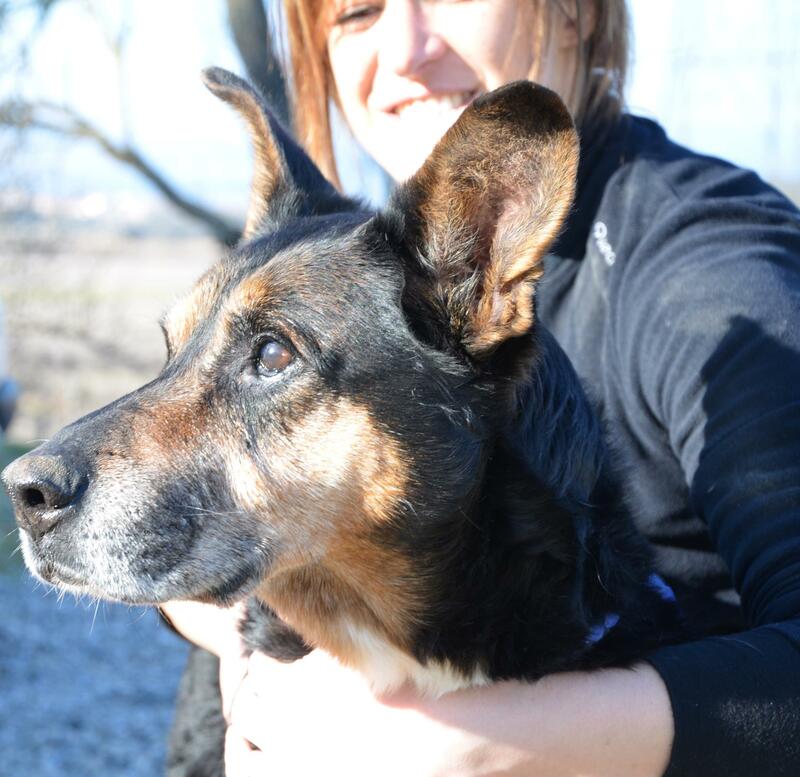 Other than that a couple of dogs were reserved, news of which will arrive as they leave, and we had yet more dogs arrive, one of whom, little Doudou, is 15 years old. Her owner has died and she is homeless. If you have a tiny space in your home for a tiny dog, she is waiting for you. A foster arrangement will mean that her vets bills will be paid by the SPA, so if you are in or close to Carcassonne, please get in touch! Oh, and don’t forget that the refuge is open the first Sunday of the month, so come and see us! There will be CAKE! Today was not good in terms of numbers, with four dogs arriving, and two more effectively being abandoned, as their owners have decided not to come and collect them after all. One of them is an Australian Shepherd, so he will find a home very quickly, at least. At about 17H00 the SPA secretary put out an urgent appeal to the volunteers for a foster family, as yet another puppy had arrived. There was no response and so I posted an appeal on my Facebook page. Ten minutes (literally) later, a new foster family had been recruited and were on their way to collect their new charge. Happy Ending means a Happy Beginning! Here is a lovely story that will warm your hearts, I am sure. At the end of February three puppies arrived, Dali, Gala and Snow. 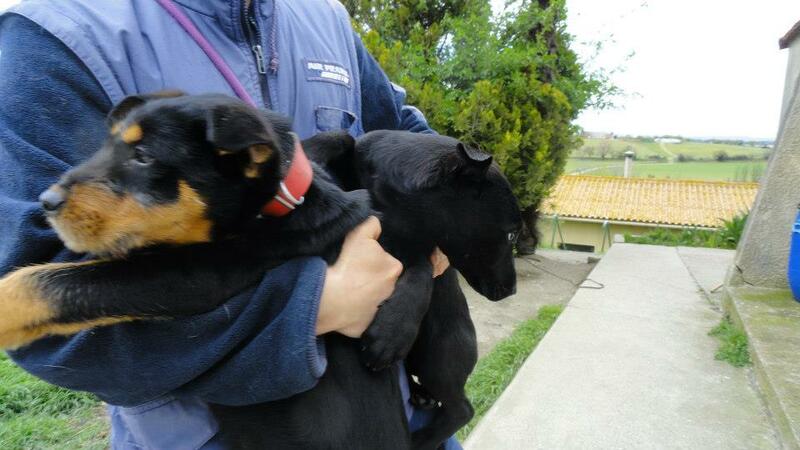 Dali and Gala were fostered together and homed soon after their vaccinations. 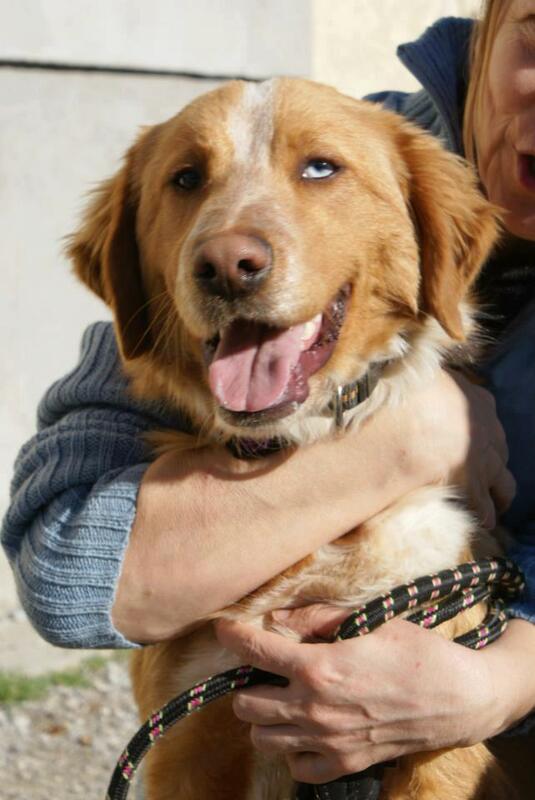 But little Snow had to stay with his own foster family, because very sadly, he was blind. His foster mum has other dogs, and they were teaching Snow about the world. Snow seemed to be responding fine, but in time we started to wonder, was he adapting to his blindness, or was he in fact starting to see shapes and shadows? The SPA vet told us that perhaps Snow was just a late developer and that we should be patient. and sure enough, a few days ago it became official; Snow can see. His vision had just developed later than usual, but he has absolutely nothing wrong with him. I was going to make Snow the Urgent Appeal on my site (www.dogrescuecarcassonne.co.uk), but he did not need an extra push in order to find a home.|I am happy to announce that today Snow was adopted and his new owner has already sent photos of Snow doing perfectly normal doggy things, like exploring in her garden! If his blindness was the reason that his owners abandoned him, then they have missed out on a fabulous dog. Fabulous adoption. Only one, but quality not quantity! Today four dogs found their owners, including one who had arrived with a fractured femur which required major surgery. Lovely that his owners came to collect him, despite the huge vets bill. Almost restores one’s faith in humanity! Little Dandy found his mum, too, so I was already in reasonably good spirits when I logged onto the SPA Facebook page. There are 4 administrators of the page, so we occasionally like to give each other surprises, and BOY, was I surprised and happy. Mitch has found a home. Our beautiful spaniel cross, one blue eye, one brown. He came in as an adolescent and did all his growing up at the refuge, unlike Mango, his brother who was lucky enough to arrive as a tiny puppy and who found a home easily. Anyway, Mitch’s long wait it finally over. Three and a half months is a long time to a dog of less than a year old! The SPA volunteer who is also his sponsor is a bit weepy tonight as she didn’t get time to say goodbye, but it is good news and we can go and visit him as he lives close by. A long and happy life to Mitch, here in the arms of his sponsor. Today was not exactly cheerful, with the dogs from the Bank Holiday weekend being registered. All 6 of them. Still, at least they are all safe and warm with us. Two of them are just puppies, so I present to you Guinness and Portia (meant to be Porter, but she is a girl, so I went a bit Shakespeare on her!). They are lovely girls and we hope they will find homes before too long. One lucky boy was reunited with his very relieved owner (and is now micro-chipped), and the sunshine meant that several dogs were walked. It also meant that our volunteer handymen could get on with more jobs! Hooray for Spring! On the subject of Spring, we received agreement from the Mayor of Berriac for the use of the foyer (ie village hall) for Sunday 5th May. We will thus be holding a Spring Fayre to benefit the SPA. No poster available yet, we need to work out what to put on the poster first. So if you want to join us please let me know. Dancers, musicians, cake bakers, tombola organisers; all are welcome! Today was a Bank Holiday, so apart from a skeleton staff to clean out and feed the dogs and cats and give any medicines, the refuge was closed. However don’t assume that the volunteers have been idle. Far from it. 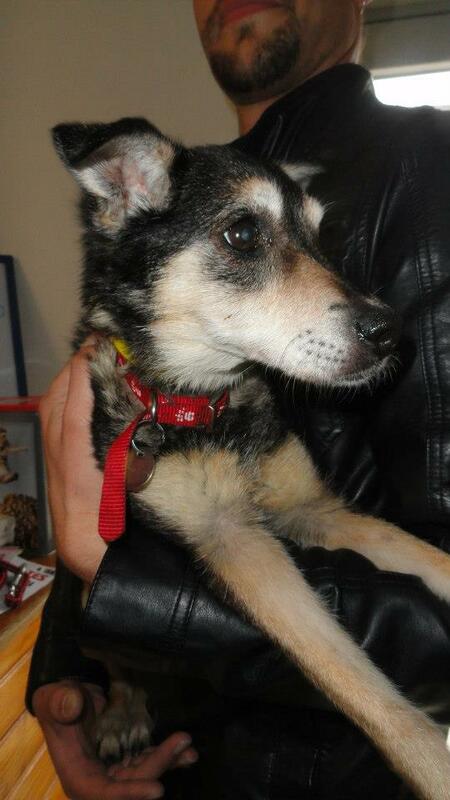 The big news was the departure of the lovely Pippa, whose arrival was described in an earlier post. 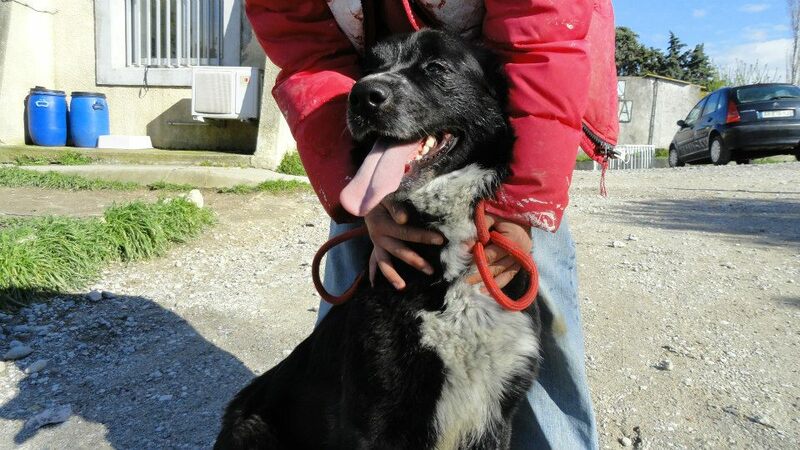 She was found starving outside the refuge and carried in by one of the volunteers in a terrible state. Today a human chain took her to her new home, north of Limoges, where she will be happy and loved by her new family who saw her on the internet and just KNEW! The delivery went without a hitch. However this did not stop me falling for a “Poisson d’avril” in the form of an urgent phone call telling me that Pippa had been lost en route. 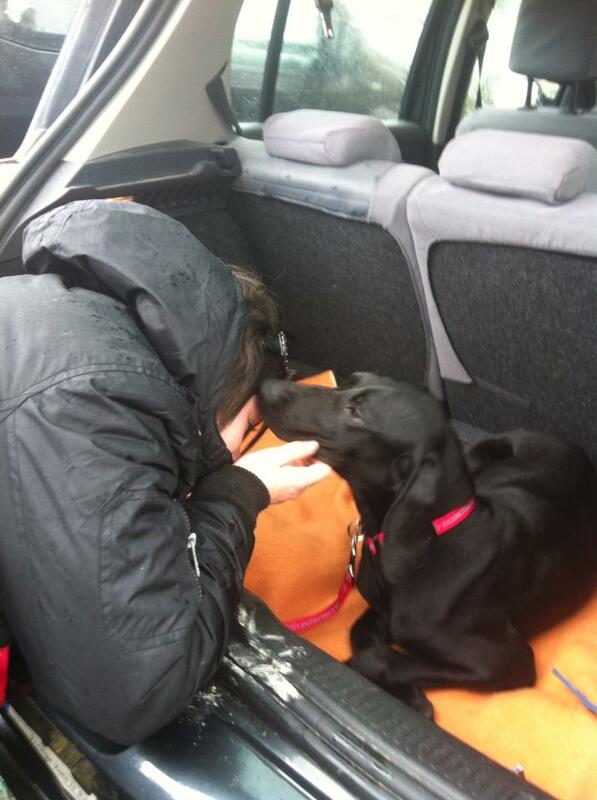 As this photo of her meeting her new mummy shows, I can just be a little bit over-protective and (yes) panicky at times! Tomorrow will be business as usual and my fellow volunteers will stop playing tricks on me for another year, I hope! Good luck in your new life, beautiful Pippa!